The cost of heating homes began to rise in the 1970’s, following successive energy crises. First, Western oil supplies shrank when Arab countries embargoed them following the 1973 Yom Kippur War. Then, in 1979, prices were again under upward pressure following the Iranian upheaval. These events were the dawn of the renewable energy revolution, in the form of wind, solar, and pumped storage schemes. They also saw the first major uptick in heat pumps. Air conditioners are heat exchange devices. In other words, they convert warm air from inside a space to chilled air they send back. Inevitably, someone thought about reversing the process. Heat pumps work the opposite way. They turn cold air outside the house into warm air they pump into it. The science is quite complicated. You can read about it here if you need to know more. However, in broad terms a heat pump comprises an air handler inside the space, plus an outdoor unit similar to an air conditioner, except we call it a heat pump to differentiate it. The heat pump draws in cold air – thermal energy – from outside and produces heat. Thus, we can imagine heat pumps and air conditioners as temperature transporters moving temperature-modified air from one space to another. The exact science does not matter, although you can follow the links if you are curious enough. What matters more from the user perspective is the heat conversion varies according to the season. Heat pumps are a thermally efficient way of raising the temperature of a confined space. This means they use relatively less energy to do their job. In fact, an efficient heat pump may use four times less electricity than a resistance heater. They are however considerably more expensive. Like solar power, they take years to recover their cost. Since their mechanisms are similar, it makes sense to combine heat pumps and air conditioners into single reversible heat pumps. Again using simple terms, these are able to reverse the flow of the refrigerant. In the heating cycle, the outdoor coil is the evaporator, with the indoor one functioning as the condenser. But in cooling mode the opposite is true, because the outdoor coil is the condenser, and the inside one the evaporator. Fortunately, as users we only need to know which switch to push! 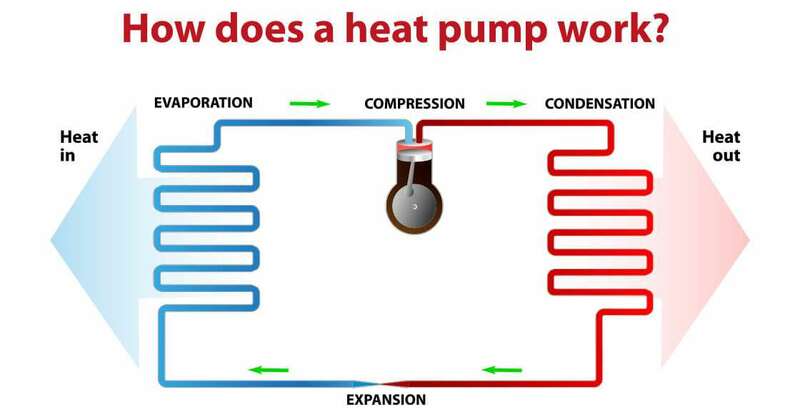 Heat pumps’ ability to increase thermal energy – in other words temperature – introduces the possibility of other applications. For example, the energy can heat water for radiators, or even circulate it under floors for heating. There are also combined solar-heat-pump applications. In this technology, solar power increases the initial temperature of water. This warm water then feeds into the heat pump evaporator for final processing, thereby reducing the overall amount of electricity consumed. Invest in a heat pump today to reap the energy saving benefits tomorrow.